My taxi to the airport should be arriving in half an hour. 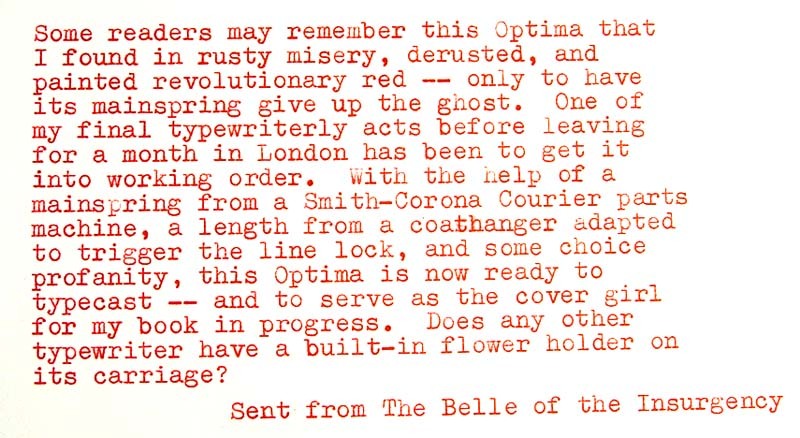 I thought readers might be curious to know which typewriter I'm taking to London for a month (because, of course, leaving without a typewriter is not an option). Some machines in the running were the Empire Aristocrat, Olympia SF, and Scheidegger Princess-Matic. But in the end, I'm taking a Groma Kolibri. This is also known (in my mind) as the Groma Air. Why didn't I take it? Because it has a German keyboard and because the Kolibri has a more satisfying and effective mechanism. Notice the much flatter typebasket and segment on the Gromina, made possible by a clever geared-typebar mechanism. Clever, but not as strong or fast as the completely different mechanism on the Kolibri. Stay tuned for some Kolibri typecasts from London. 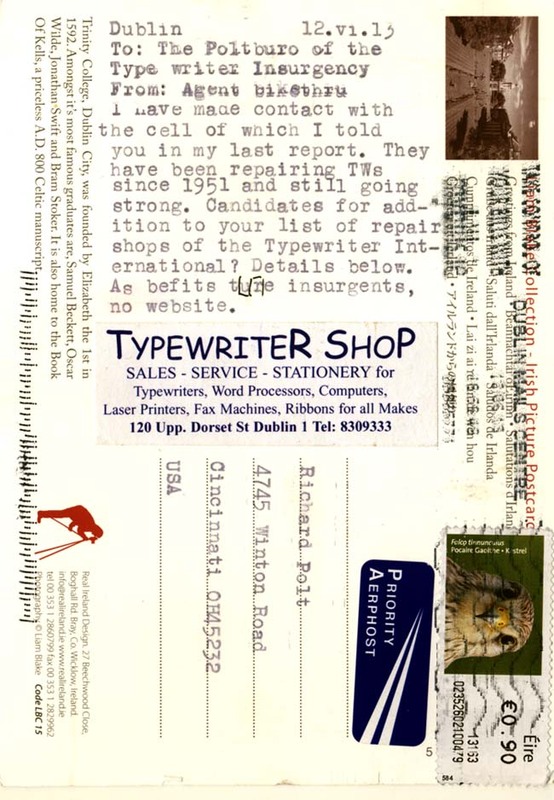 Issue 47 of Fred Woodworth's Mystery & Adventure Series Review recently reached me, along with a short essay by Woodworth on why he uses a typewriter to produce the publication. 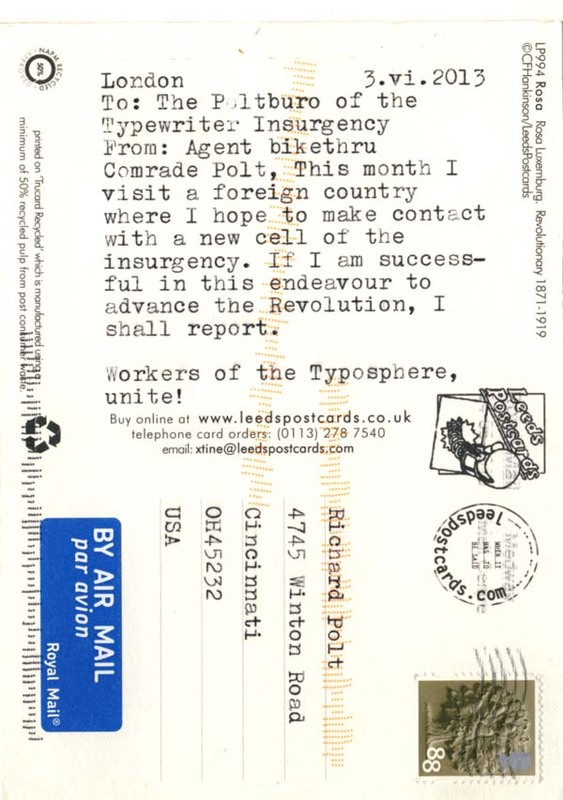 If all goes well, this essay will eventually be incorporated into my book, The Typewriter Insurgency: A Field Manual for the Typewritten Revolution. 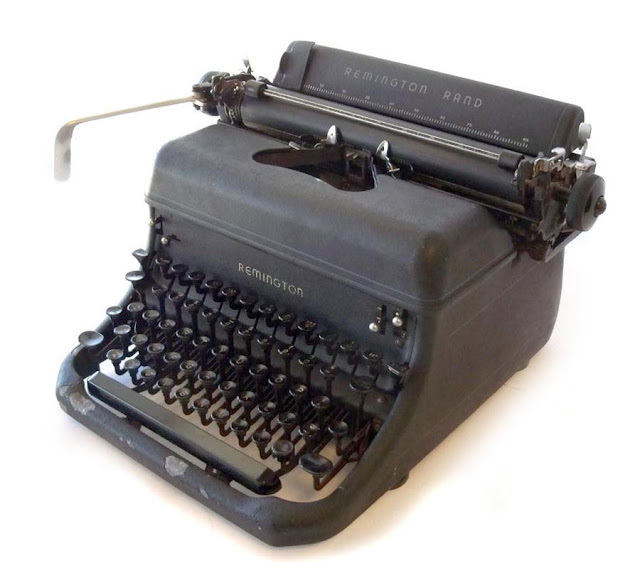 Woodworth writes in praise of this mechanical technology: "I can use it in every sense, instead of being used by it." 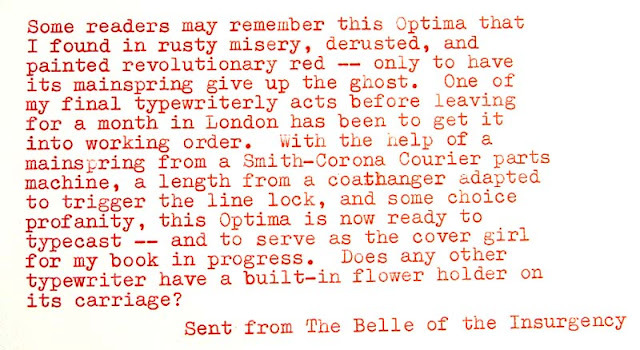 In the same issue he makes the delightful observation that since the mainspring in an old typewriter or clock normally remains partly wound up, it contains potential energy that was put there by a particular human being decades or even centuries ago. Thank you, kind sir! I haven't reproduced the name of this reader in Alabama since I don't know whether he wants it publicized on the blog. But I appreciate this well-written illustration of writing to the future and of a complex exchange among media. 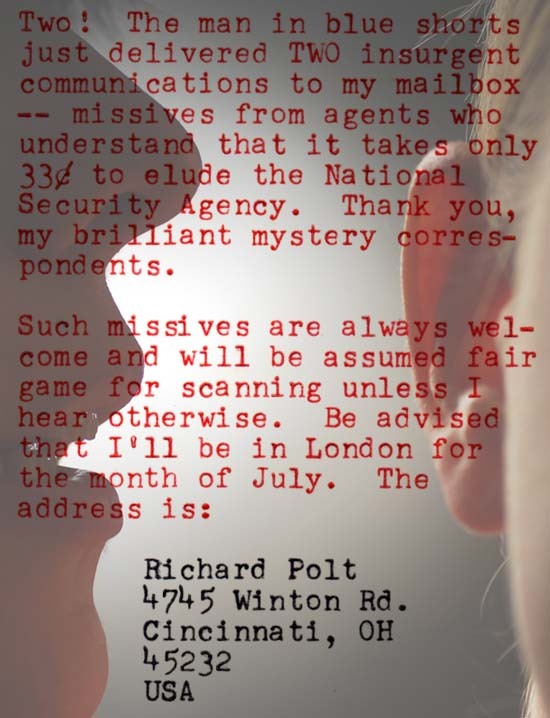 My January 2013 essay has now been referred to in a letter published in June 2013. An intolerable delay? 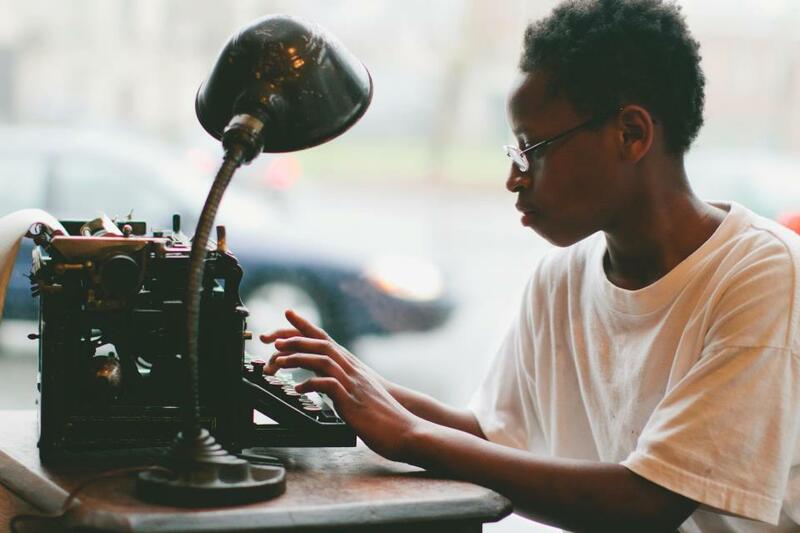 Not at all—this kind of temporal distance can provide room for reflection and deeper consideration, whereas online, we're apt to forget what we read within hours. The thoughts exchanged here went from typewriter to blog to typewriter to Varityper-printed magazine to blog—a model of fruitful typewriter-computer interaction. 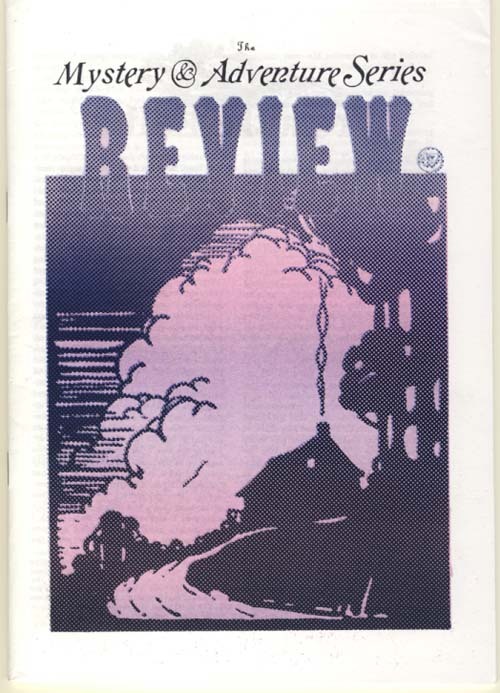 I have two copies of this issue of the Review. If you think this is a publication that might seriously interest you, be the first to request a copy in the comments and it will come your way. 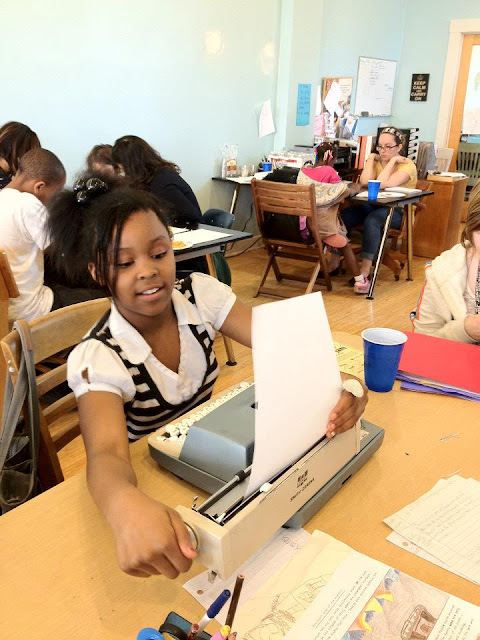 Things (including typewriters) are hopping at WordPlay Cincy. 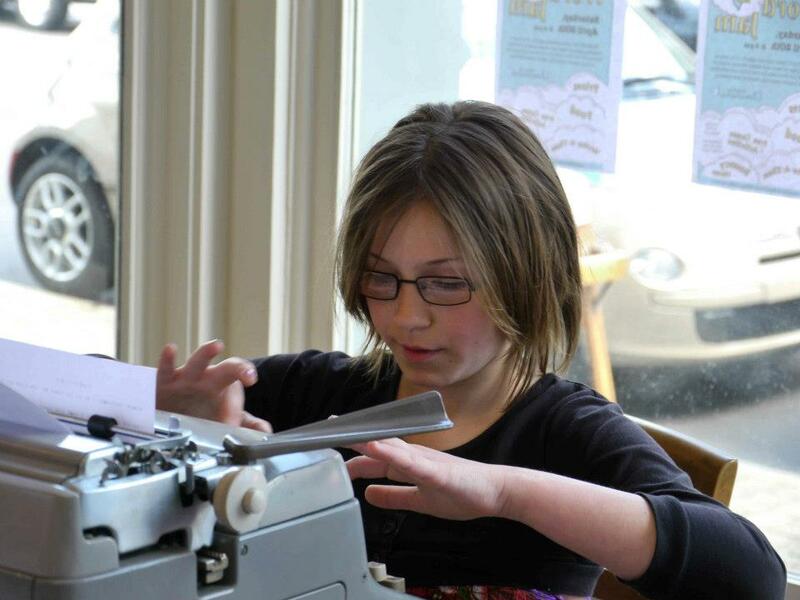 We're also selling typewriters in The Urban Legend Institute, and typospherians have responded to my call for donations. Tom also donated a nice Royalite which was bought even before it could make it to the Urban Legend Institute; typospherian Miles Stearns came through town needing an ultraportable, so now it's his in exchange for a suitable donation to WordPlay. 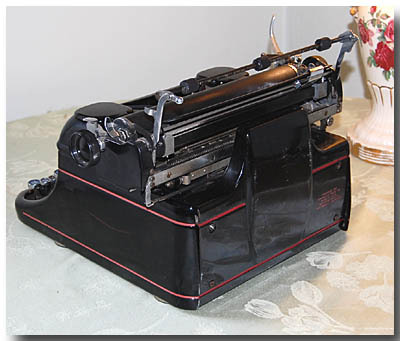 Ton S. donated his Olivetti Lettera 12. 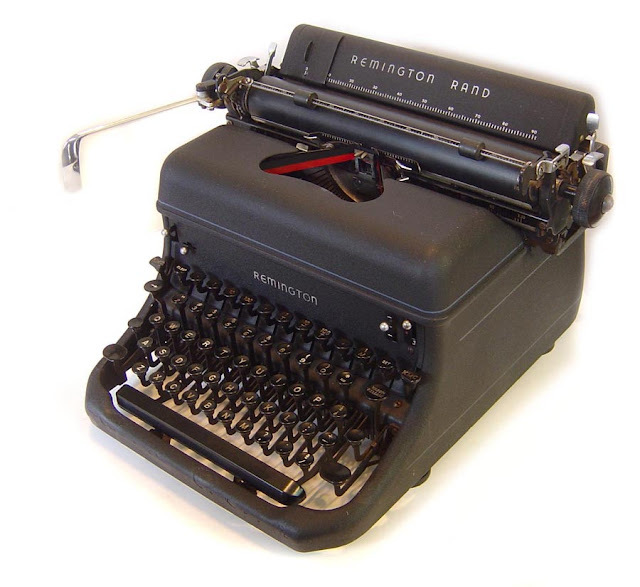 What a futuristic, high-concept typewriter this is. I was surprised to learn that it was introduced as far back as 1979. To fix a rattly return, I needed to remove the carriage (4 screws) and the body shell (another 4 screws). When I figured out the problem, a little stretching of one tiny spring did the trick. The mainspring also needed a little tightening. With the shell off, this is still a very interesting-looking machine, with dowel-mounted keylevers in a complicated plastic housing. Also for sale is this little Wizard Truetype that came to WordPlay from a local donor. 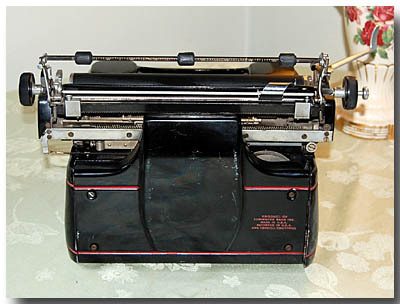 I wish I had a "before" picture: it was filthy, the carriage return lever wouldn't stay up, and the gray paint had worn off on the corners. This called for a new paint job. The trickiest repair was fixing the return lever (a ball bearing was missing) and the line advance mechanism (a tiny nut was missing). Removing the left platen knob is very fussy on this machine. But the end result is a good-looking, functional little typewriter. More donations are in the works, and I thank the donors in advance. 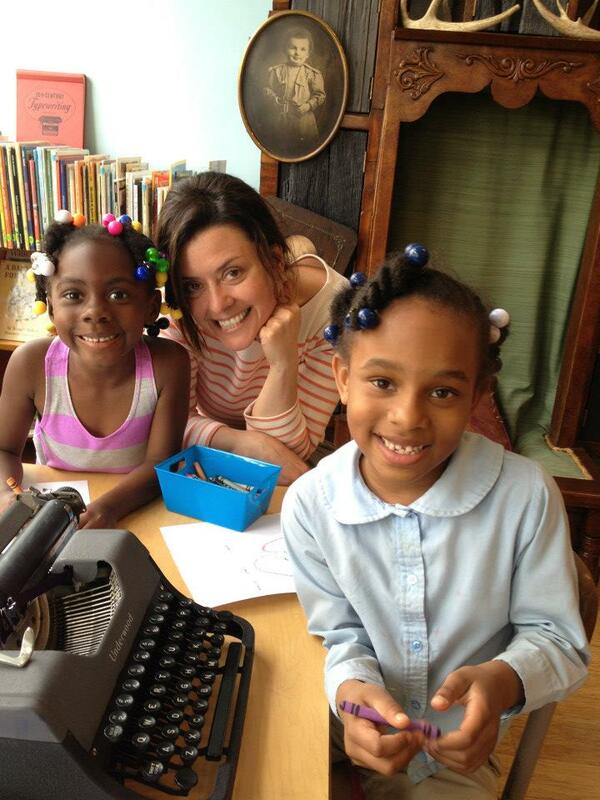 I'll also share these inspiring photos from WordPlay's Facebook page. This rather ordinary craigslist ad sent me on a safari today. While my daughter was at a 3-hour birthday party, I decided to hit the road to Miamisburg, figuring I would at least get a nice Sunday drive out of it. Miamisburg is a town on the Great Miami River (Ohio, not Florida) which I'd never visited before. I avoided the Interstate and took Ohio Route 127, passing through Hamilton. This is a rather decrepit industrial town that got the bright idea in the '80s of calling itself Hamilton! with an exclamation mark. It didn't work. Still, it has some beautiful spots. 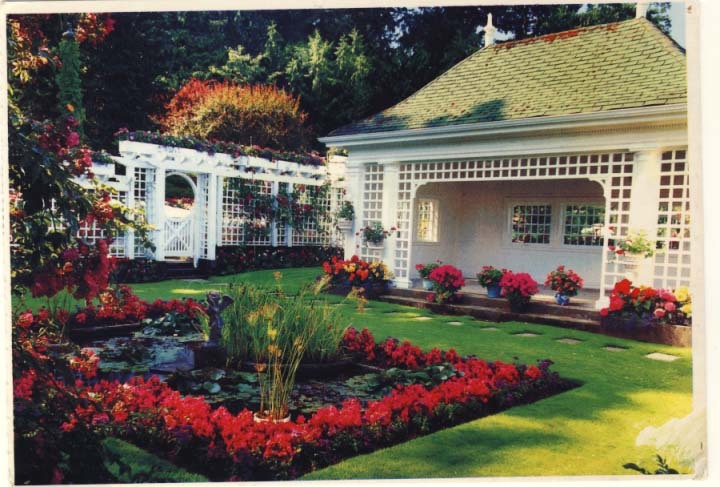 I discovered the Dayton Lane historic district, with gorgeous houses like these. I think these old factories have a decadent beauty of their own. 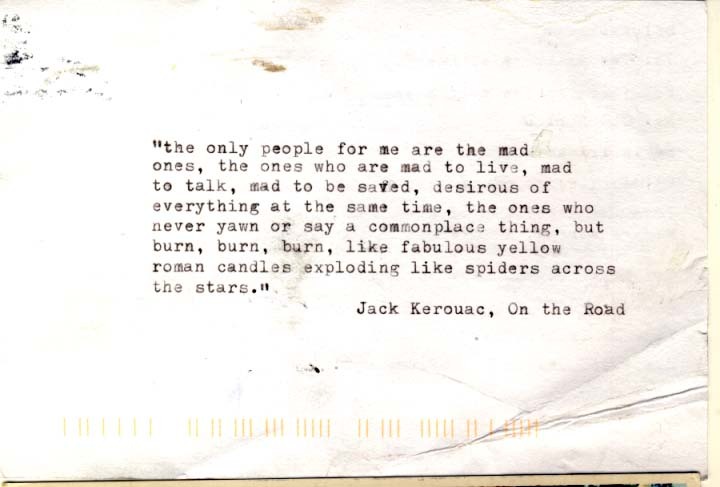 After Hamilton there was wide-open country road with almost no traffic—the kind of driving that lets me breathe free. I passed through the metropolis of Gratis (pop. 881) and other villages I'd never visited before, finally reaching Miamisburg. Well, the Royal was gone and there was not another open antique shop to be found. The town is charming, though, and they have an excellent Masonic Temple. 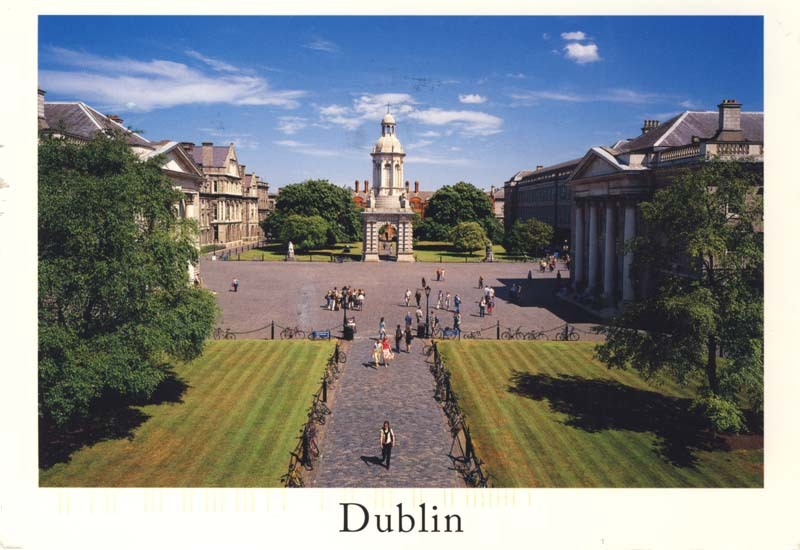 Yes, the sides really slant, forming the base of a very tall invisible obelisk. 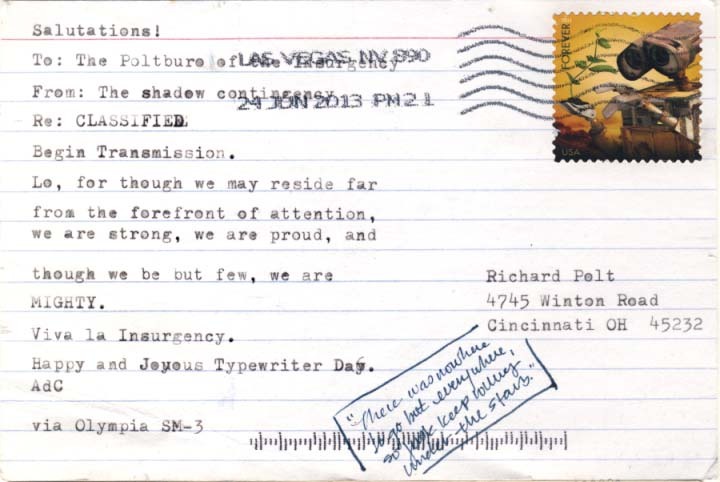 My typewriter bone was still tingling. I figured I had just enough time to make it to the Ohio Valley Antique Mall, already featured in my February and April safaris. I zipped down Interstate 75 and was soon in the mall. 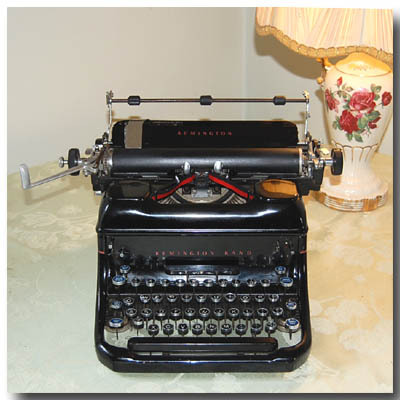 Sure enough, many of the old typewriters had disappeared and there were some new ones, such as this wide-carriage Underwood for $42.50. 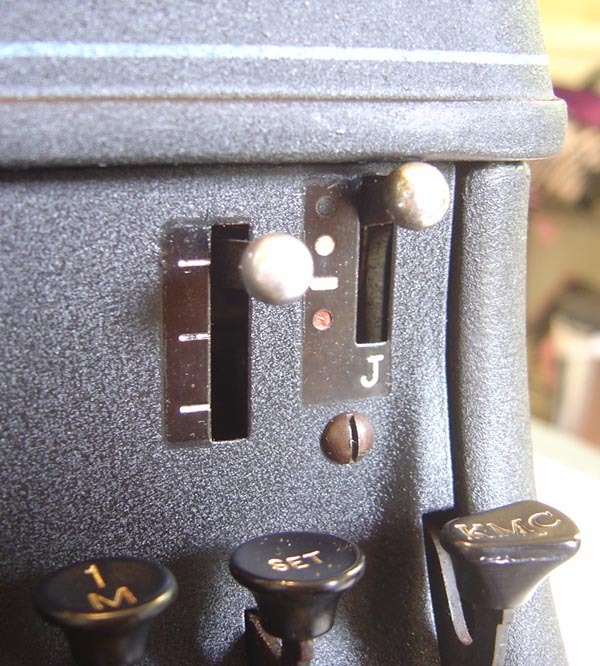 Its serial number, 4654007-18, dates it at 1937. Our next Underwood is S5575626-11, from 1942, for $38. This Smith-Corona Galaxie Twelve from the late '70s (?) was priced at $45. Back to the Underwoods. This one, 11-6630507, was made in 1949 and cost $74.95. A Royal Companion (no tab, no touch adjustment, no Magic Margin), S3281457 from 1956, price $39. No, actually, it was tagged at $75. 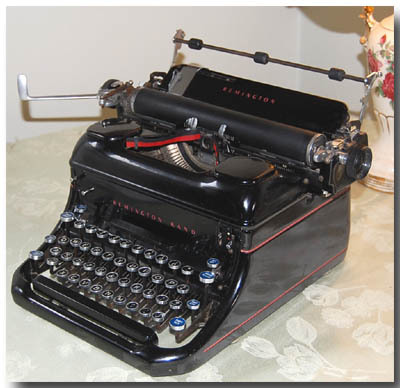 Its serial number, UB-98322, identifies it as a Varsity model and dates it at 1939. 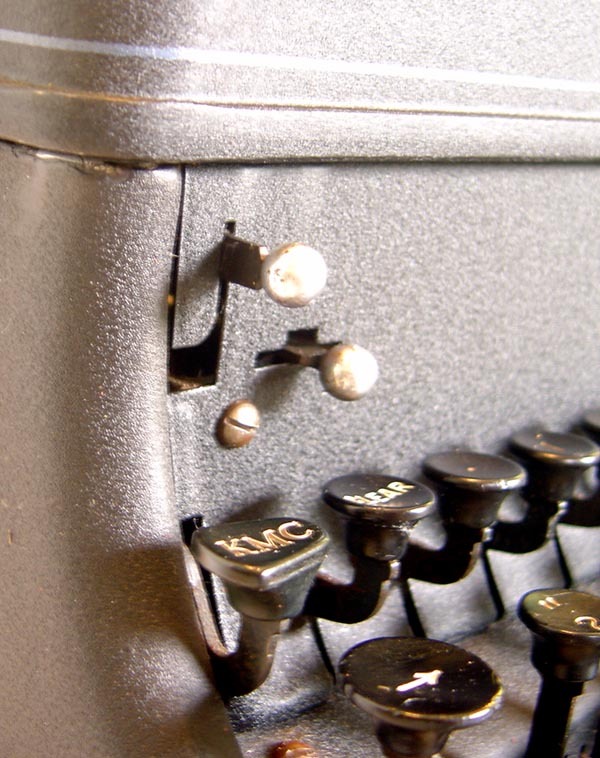 Here's an item for only $6 -- an empty Underwood case. Well, I had 15 minutes left to get back to my daughter's birthday party, just enough. It was time to leave. A Coxhead DSJ (Differential Spacing-Justifying) Varityper. I have never seen one in person before, and like Robert Messenger, I've been curious. $120? ... Um ...... I'll take it! The machine is now in my trunk, awaiting attention. The tag says it doesn't work, but we'll see about that, once I've thoroughly cleaned it. There's a nice set of type shuttles in the drawer under the keyboard. I'm excited to dig into this device and educate myself. I currently have this '30s Varityper in my collection, but the DSJ is a whole new level of complexity. Wish me luck! 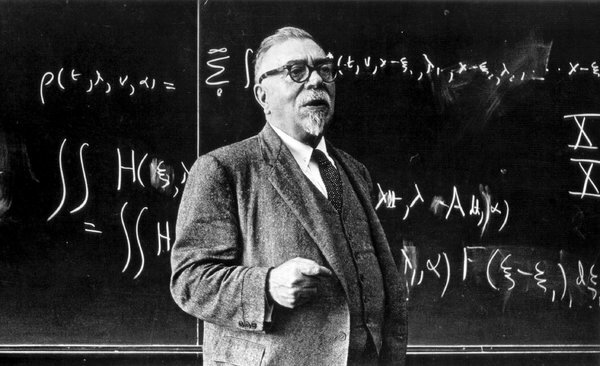 Norbert Wiener (1894-1964) was a great American mathematician and pioneering computer scientist who coined the word "cybernetics," meaning the science of communication and control in animals and machines. 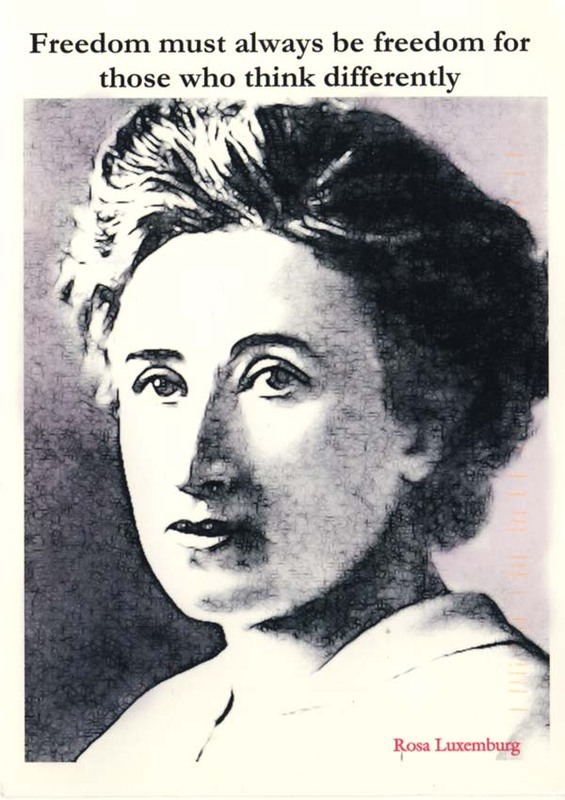 In his book Cybernetics (1948) and the more popular, nonmathematical The Human Use of Human Beings (1950), he introduced the public to concepts such as information, input and output, programming, feedback, and artificial intelligence, as well as speculating on the future of information technology. 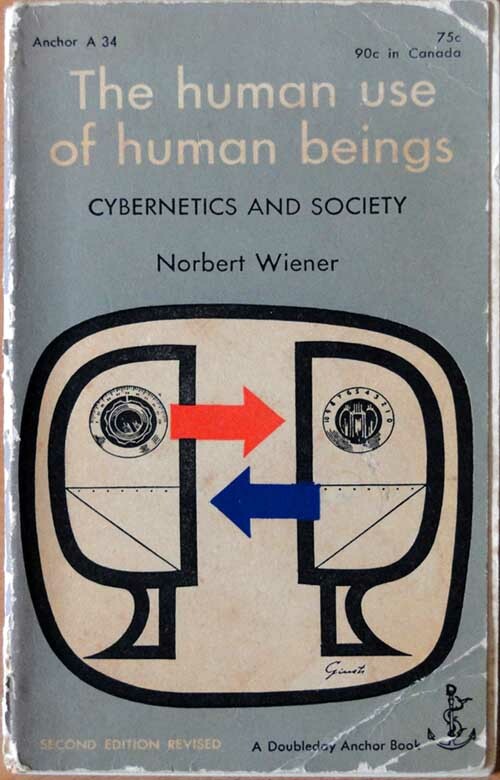 Wiener makes the very interesting point that computing can be a Pandora's box: the more arrogant and power-hungry we get in our invention of information-processing machines, the more problems we create for ourselves—possibly insoluble and fatal problems. What do you think? Have we developed computing using humility or arrogance? I know my answer. Does this typewriter appeal to you? You guessed it, it's the same machine, after suitable application of Scrubbing Bubbles, Pledge, steel wool, Mother's Mag and Aluminum Polish, and touch-up paint. 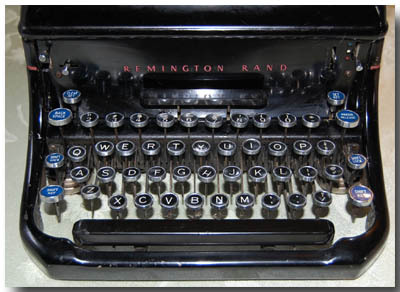 The Remington Rand KMC is still an understated machine, but you can see that it's handsomely understated when its paint is revealed as black (not gray), its return lever shines, and you can even see the light-blue pinstripes around the lower edge of the ribbon cover and on the sides. (Of course, being a sucker for glossy Deco designs, I would really like to find a breathtaking Remington 17 like the one below. I've only seen one in this style, ever, which was in the collection of the late Don Sutherland; I don't know where it's gone to, and all I have are these little photos. I got my first Remington (my Noiseless Portable no. 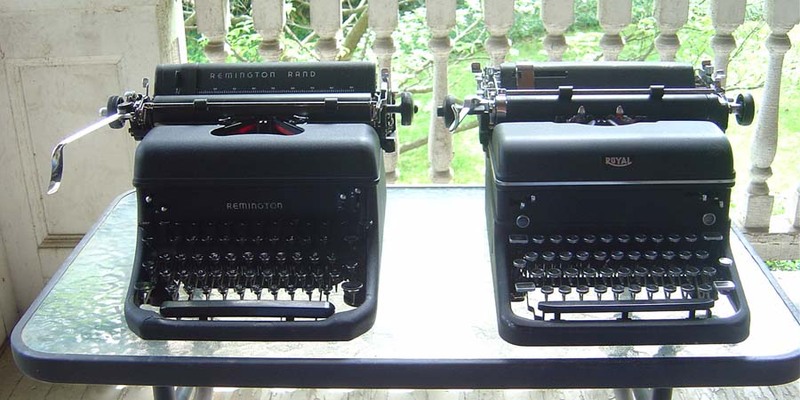 7) about 35 years ago, and started collecting Remington portables some 19 years ago, but my experience with the big modern Remingtons was almost nil until I cleaned a Remington 17 for a WordPlay customer a little while ago and was pleased with its quality. I decided that I'd like to have a KMC, the automatic-margin brother of the 17. (The 17 has awkward margin settings in back. The left stop controls the right margin and vice versa, as on Underwoods, which is due to putting the stops on the body of the machine instead of on the carriage. It's confusing.) So when I saw a KMC that looked pretty good for a reasonable price on Etsy, I snapped it up. 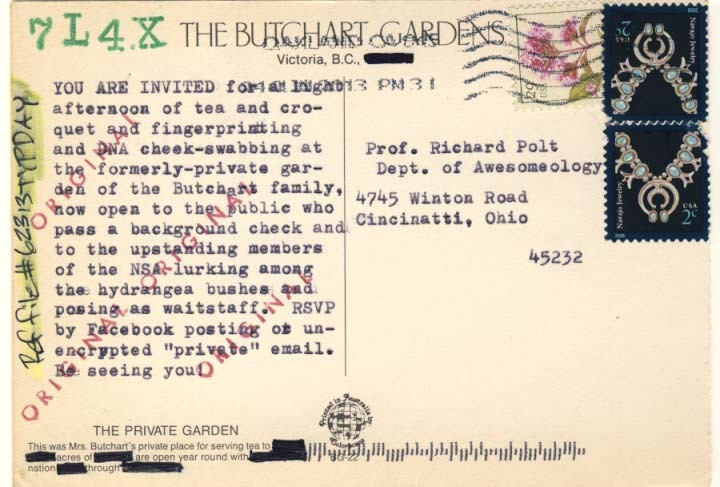 The typewriter has several nice features, such as this paper bail which stays forward, away from the platen, when you pull on the chromed piece in the center of these photos. Then, when you want it to return, you push down on the piece and it snaps back. This KMC (#JT1048602) was made in December, 1946. The T may indicate the 10-place decimal tabulator. The model is contemporaneous with the Royal KMM, has a similar aesthetic, and a similar set of features—notably, the automatic margin setting (KMC = Keyboard Margin Control, similar to Royal's Magic Margin). 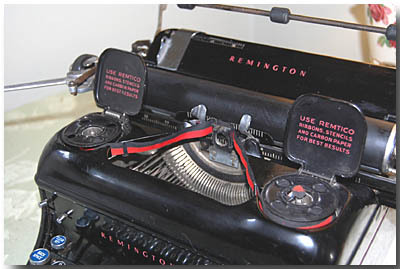 As Ryan Adney has documented, this similarity led to a lawsuit from Royal that forced Remington to drop the feature. 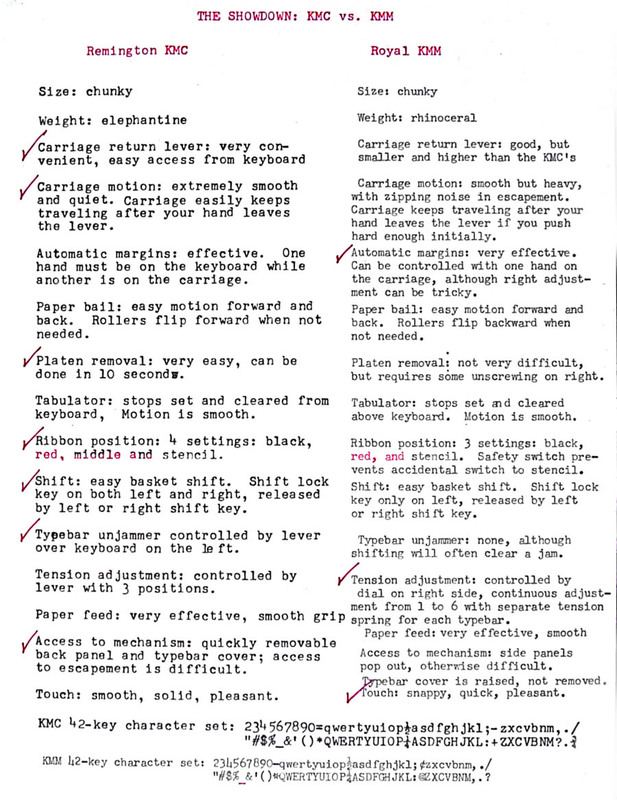 The KMM isn't listed as such, but it looks like between the first KHM Magic Margin and the KMG, 1,576,478 typewriters were made. Of course, later models retained the Magic Margin feature. 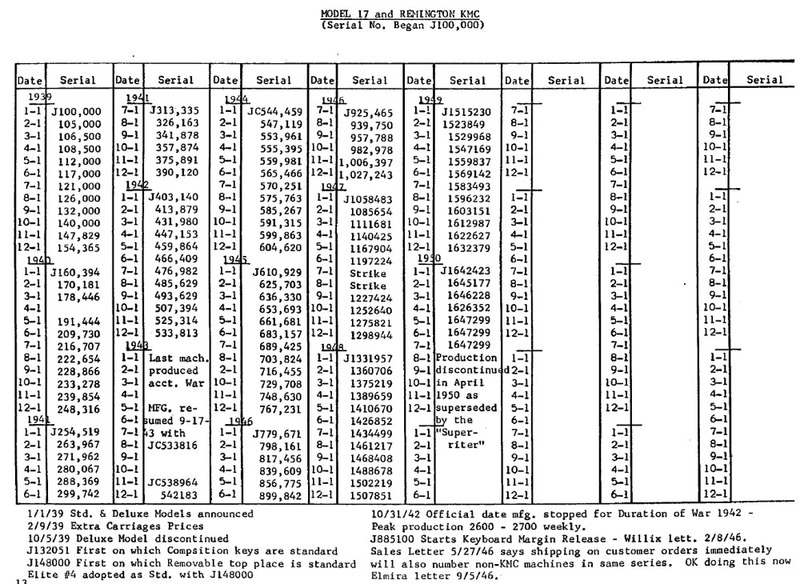 Lots of data here, but the key facts are that the KMC machines run from J885100 to J1647299, and that some non-KMC typewriters are included in those numbers; so total production of KMCs was under 762,199. This confirms my unscientific impression that the KMC is less common than the KMM. But how do the rivals compare in use? And here are the results of my comparison. Areas of clear superiority, in my opinion, are marked with a red check. 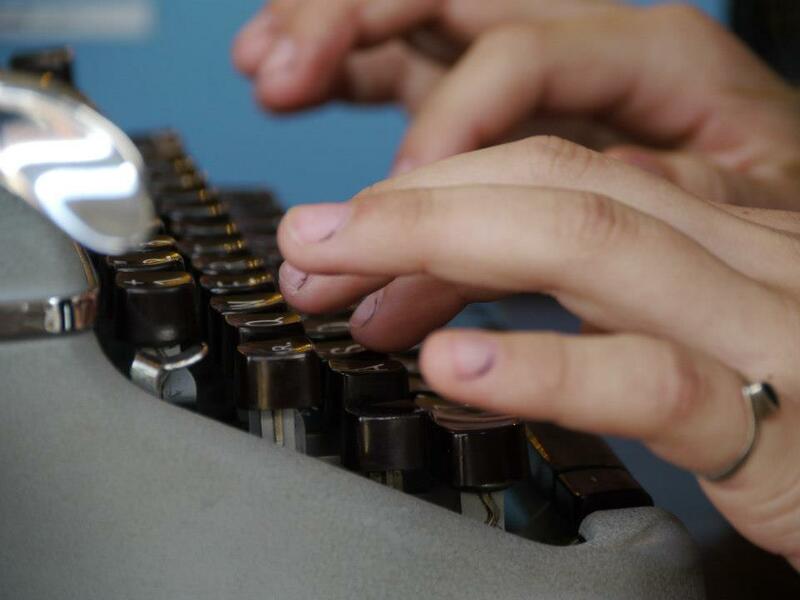 You'll see that the Remington comes out ahead in most categories, in my view — but the category that most typists care most about is touch, and there I think the Royal has an advantage. There's nothing wrong with the Remington's touch, but the Royal has some extra speed and springiness—your hands almost bounce on the keys. 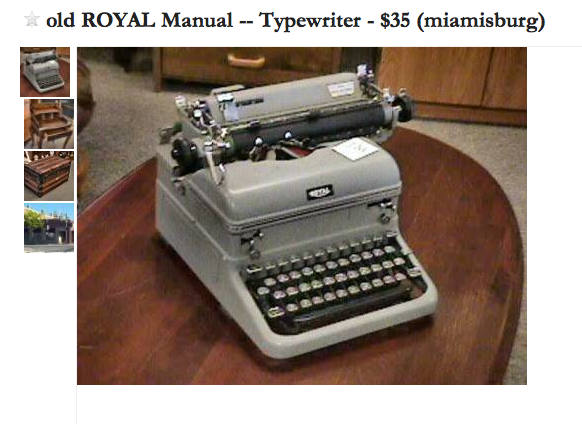 For extended typing, especially if I wanted to go fast, I would probably choose the Royal KMM. But you may have different preferences. 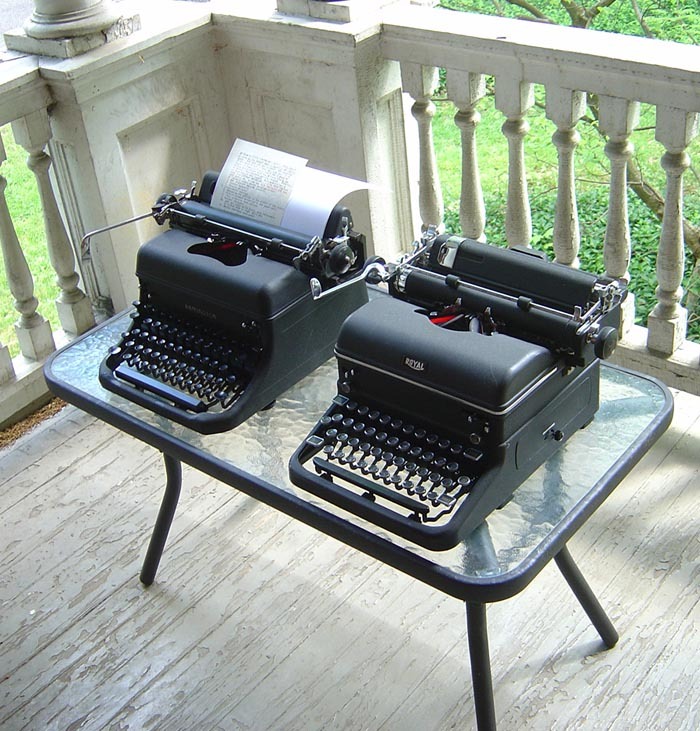 I don't think you'll go wrong if you choose either of these fine writing machines.